We live in amazing times. With a few keystrokes, we can look up any information on any topic from almost any source. As scholars, we have access to even more; article databases stuffed full of the best, most up-to-date academic research on every conceivable topic, all keyword searchable and at our fingertips. However, retrieving all this information requires a bit of skill. If only language was a perfect system, in which each word had one distinct meaning. But sometimes it seems like the English language was created in one big, uncoordinated linguistic jam session, which multiple meanings jammed into single words, creating so many homonyms that we’ve ended up in a keyword jam. If the word ‘jam’ can mean three different things in that last sentence alone (not even counting the most common toast-related meaning) then what hope do we have for targeted keyword searching? My PhD topic was science communication in literature, with a focus on representations of cloning in novels. Searching for the literature on literature was a keyword nightmare. Every word I used to search for information on my literary sources was ambiguous. ‘Literature’ means fiction, but also the scientific/academic literature. ‘Novel,’ in a scientific context, means new or unique. ‘Fiction’ is often used in the context of ‘science fiction’ to describe something that seems made-up. It took a lot of trial and error to figure out keyword groupings that returned the results I needed. As if all these homonyms weren’t bad enough, we have to think about multiple different words that mean the same thing. I started out searching for ‘cloning,’ but quickly realised that I was missing out on a lot of important sources that used alternative terms like ‘replication’ or the broader ‘genetic engineering’. Plus different terms may be preferred in different parts of the world, so even if there’s one keyword relevant in New Zealand, there may be others you need to search that are in use elsewhere. It might help to make a keyword table full of all the words and phrases you need for your topic, plus any synonyms. Brainstorm all the keywords that you think might be relevant. You can look up general synonyms for your keywords at thesaurus.com (though bear in mind that many general synonyms won’t be relevant in the academic literature). As you read, take note of synonyms that are specific to the academic use of the word, and add to (or revise) your keyword list accordingly. A few words about the Google search logic: Google uses its ‘knowledge’ of language patterns to deprioritise words like prepositions and articles that tend to be less important (e.g. ‘the,’ ‘and’, etc). However, you can target your most important words by simply searching for keywords rather than full sentences. You should also consider your keyword order, because Google assumes that the earlier a word appears in your search phrase, the more important it is. OK, so with those tips in mind, here are a few Google hacks to help target your search. Double quote marks specify an exact search phrase, and only exact matches to that phrase will be returned. The minus sign removes keywords that you don’t want results for. This will return hits for the construction industry, rather than arts & crafts. 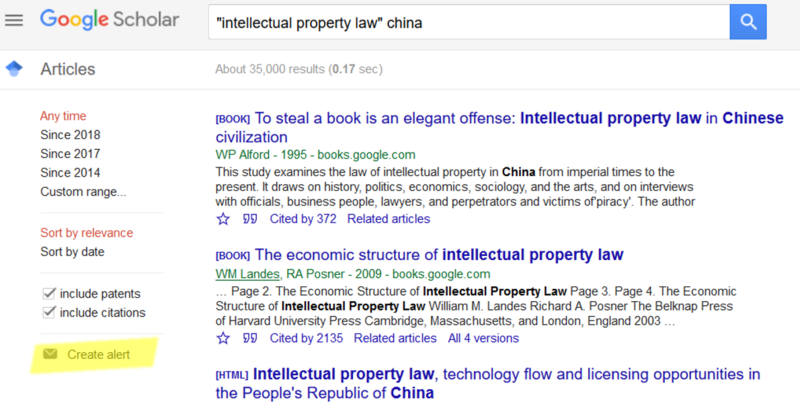 This tells Google to look for either of the search terms next to the OR, but not necessarily both of them. This will return hits that include the phrase “occupancy rate” in reference to either hotels or motels (or both). This will return articles referencing all kinds of transgenic organisms in Mexico. If you’re not using the ‘Advanced search’ function, you should definitely give that a go too. It’s in a new location since Google updated their interface last year; click the menu button in the top left-hand corner to find it. Most databases have some kind of alert system that enables you to have new search results emailed to you for your favourite searches. With Google Scholar, simply perform your search, then click the envelope icon in the sidebar on the results page to create an alert. You can create as many alerts as you want; you can even get alerts for any new papers by a specific author, if you are focusing on a particular scholar or theorist’s work. If you need to keep your finger on the pulse for non-academic sources as well, you might like to create some general Google alerts. Go to google.com/alerts to get started. This is a really useful post. I learned some new tools and you reminded me of some I had forgotten. Thanks Anaise.